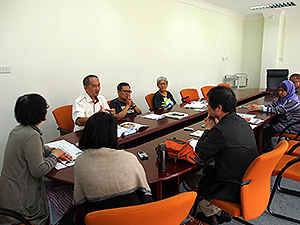 The Japan Consortium for International Cooperation in Cultural Heritage conducted several surveys in partnering countries Malaysia and Nepal in February. The surveys had 3 goals: to gather information about the current state regarding issues with safeguarding of cultural heritage, to ascertain needs related to those efforts, and to explore the possibility for international cooperation. In Malaysia, Consortium research members met with the Director of the Department of National Heritage from the Ministry of Tourism and Culture and other representatives. The meeting provided general information about the system for safeguarding cultural heritage at a national level. Afterwards, they toured through the historic cities of Melaka and George Town (World Heritage Sites) and the archeological site in the Bujang Valley of Kedah and examined the state of preservation of those sites. They also visited Kuching on the island of Borneo, where ethnic minorities continue to preserve their traditions. Consortium gathered informationabout the system and efforts to safeguard the area’s tangible and intangible cultural heritage, which differs from thoses in Malay Peninsula. In Nepal, Consortium research members observed the UNESCO Japanese funds-in-trust project initialized to preserve cultural heritage in Lumbini (World Heritage site) and the management of the conservation of traditional buildings in the Katmandu Valley. They viewed intangible cultural heritage in forms of the Hindu festival of Maha Shivaratri and Gyalpo Lhosar (celebration of Tibetan New Year), and interviewed locals. 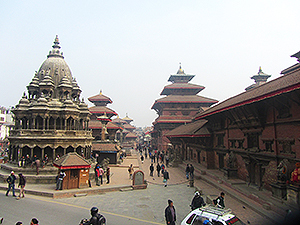 In addition, Consortium visited the UNESCO Office in Kathmandu, the Ministry of Culture, Tourism, and Civil Aviation, the Department of Archaeology and the Kathmandu Valley Preservation Trust to gatherinformation.